Eric Donovan is well used to the monikers. He understands it; they made it to the Olympics, he didn’t. 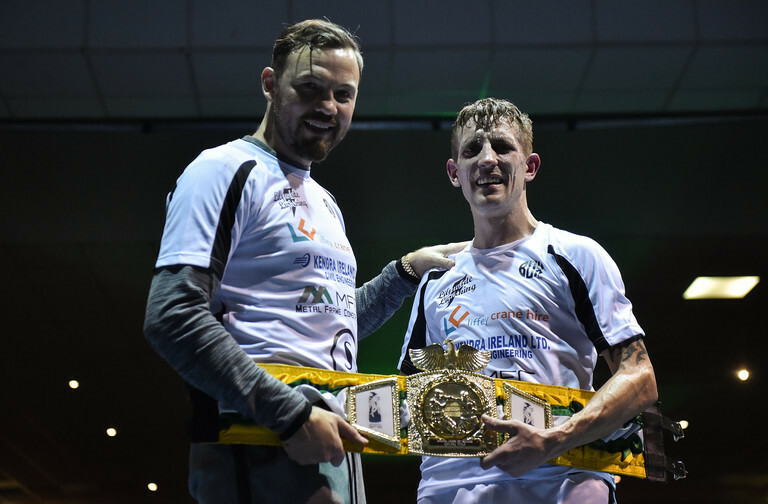 But after seven professional fights, a BUI Celtic belt, five-time Irish Elite Senior Champion and a European bronze medal, he is entitled to be known for what he is, an extremely talented boxer. The guy who trained with Paddy Barnes, Katie Taylor, people like this. Look, they are all my teammates. I have the utmost respect for them and I love those guys. I wish them well, I want them to do well because I’m a fan of all of them, but sometimes you feel like you’ve missed your own calling and suffered the consequences for it. The Athy southpaw is out to make his own name now. His eyes are fixed on a European title. Next week’s Ring King event in Waterford is another step on the way. Eight weeks of preparation go into that fight. Meanwhile, he balances his health and fitness company with his training. Because he does not have a promoter, Donovan manages his own ticket drops and arranges meetings with fans throughout the week to grab a coffee and exchange tickets. In a hyper-commercialised world where the typical fighter is totally removed from logistical concerns, Donovan is engrossed in them. I’m working a day job, I’m working a lot of hours and I train a lot of hours. I’d love nothing more than someone to invest in me and a promoter to sign me up. Just give me a lift, lay down a path for me towards a European Title and possibly World Title, I’d love that. I would love to have nothing to do and train every day. Train and eat, that would be ideal for me. But I can’t do that… I have bills. I have two kids. I have to run a house. I have to run a business and pay taxes. I have to keep all those things going and keep everything up in the air. I’m not bitter about it. It is a valid point, there is a part of me that wishes I got to the Olympic games, but I have to accept I didn’t and move on. After all, he is more than familar with the sport’s frantic bids to attract viewership and revenue. 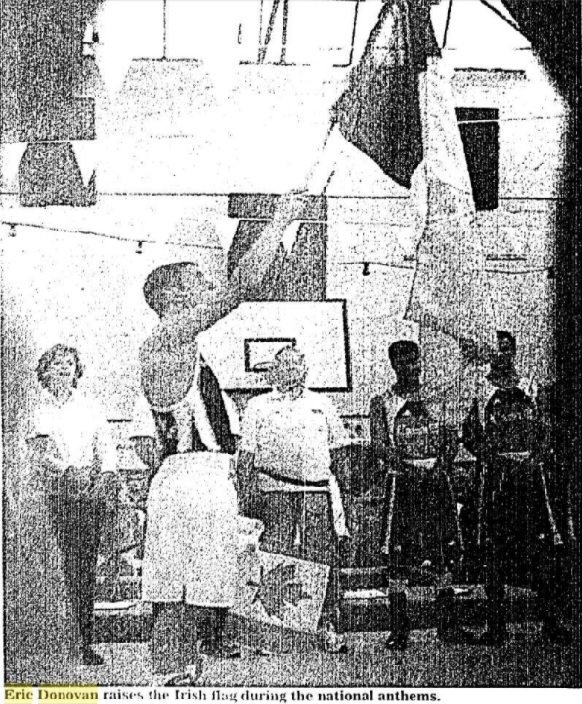 In 2003, an 18-year-old Donovan boxed in a weekend event that included a fight night and a dinner-boxing party as his club, St. Michaels, welcomed a Canadian team to Kildare. 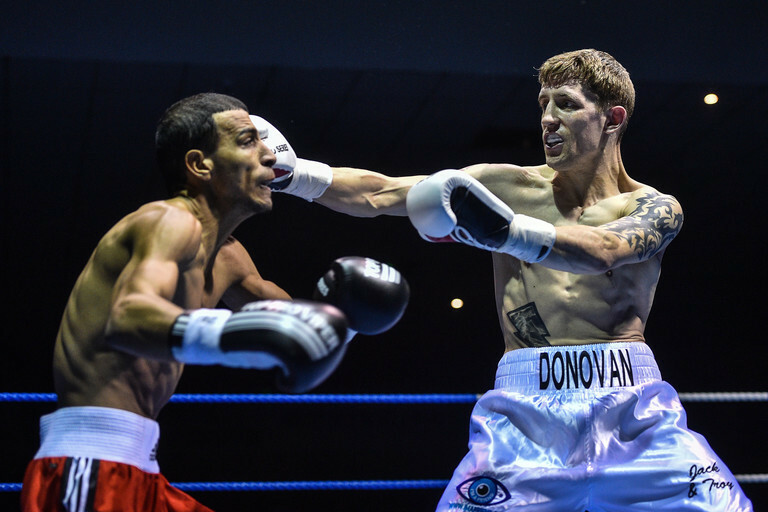 Donovan won his bout convincingly when he dropped the Canadian featherweight champion in the third round. Since then he has had significant success but continues to fend for himself. Exposure to predicaments such as these can often, paradoxically, bring hidden pleasures. Donovan concedes to this burden because at the heart of it, it is face-to-face fan interaction. He regularly meets and intermingles with the very individuals who allow him to climb into a ring and demonstrate his ability. It is exciting because I get to go and meet all my fans when I’m selling tickets, keeping diaries for my tickets. My ticket drops are planned as meticulously as my training plans, it is interesting. This is a good experience for a pro athlete to have, but not many could talk about it. I meet a guy for coffee, another for lunch, another guy outside the training gym. I would like to one day not do all that stuff, for now I am doing them and there is not much I can do about it. I don’t want to sound like I am complaining either, to be honest with you I don’t have to do this if I do not want to. I can go and expand my business, work more hours and turn more money than I am as a professional boxer, but that is the life I choose. That is the life I want. I am chasing something, and I really want to do it. I think I can do it and I believe I can, it’ll be all that more sweet and satisfactory when I do. Boxing is a unique sport where intuition is as important as skill. At 32 years of age, Donovan is aware of mistakes he has made and what science needs to be applied to his specific needs. His learnings as a physical trainer helps him understand past failings. I suppose when you get older your more open to taking on board the advice you get. The nutritional advice, when I was younger I was boxing 60kg as an amateur and if I had known then what I know now, I would have been a 66kg boxer. I don’t know, maybe it is ignorance at the time or just wanting to do things my own way, you’re set in your ways and burning yourself out. Now I train hard and seem to have a lot more energy at 67kg than I had as an amateur at 60kg. After Donovan’s long-term coach Dom O’Rourke became IABA president, the Kildare man was in search of a new mentor. Last December, it emerged that Donovan was being trained by former WBO middleweight champion Andy Lee. The pair were childhood friends and trained together in the past. He approached Lee for one primary reason- education. Every day is a school day when you work with Andy. Ireland hasn’t really got a whole lot of professional knowledge because it hasn’t been consistently professional boxing even though we have a rich heritage with it through the years. It has been in dribs and drabs. It was Bernard Dunne and [Wayne] McCullough and Andy Lee and Frampton, but now it seems to be a lot more and a lot more coaches getting involved. Andy has been out there with Emanuel Steward and Adam Booth, who go way back and are involved in the game for years, especially Emanuel. You can imagine the wisdom and knowledge that he passed onto Andy. I can take some of that from him, absorb it and use it, it’s class. The bedrock of their relationship is an age-old friendship that ensures a gentle ease and respect exists between the pair. The Irish boxing circuit is a close-knit group. As schoolboys, boxers intermingle, train and develop together. Eric and Andy suit each other. Donovan looked even more impressive last time out, while Lee made his debut as a pro coach. We’re friends since we were 14. We went to the European schoolboys and did great in the year 2000. Andy was 15 and I was 14. I suppose with Andy we are always friends, that is the underlining thing; friends first. When we work in that boxing capacity, obviously you need a rapport with your boxers and coach. There has to be some sort of rapport there. I’m lucky enough we already established that because we are friends so in the capacity of coach and fighter, leading up to a fight, I just respect everything he knows and respect everything he is telling me. Lucky enough for me, I didn’t really have to reject anything because it all made sense. He is a southpaw, I am a southpaw and he thought me some things that added to my style, a massive addition. We just hit it off from there. You see so many boxers leaving coaching throughout the year, sometimes I think that can be more about the boxer than about the coach. Donovan boxes in a flexible, almost-contrarian style. The lightweight presses hard, seemingly leaving himself open to counters yet never looks flustered when they land. At times his hands shelter his eyebrows, then drift to his waistline, urging his opponent to come out of his shell. This time last year, Donovan countered well and operated in measured flurries of white as his gleaming shorts and white-tipped gloves exploded forward in unison upon Stefan Nicolae. With his new coach, work has begun on expanding his style and developing what Lee knows best. He taught me how to work in close, it’s not a place where you want to be all the time but he taught me how to work off the ropes and not to panic when I’m there. How to be confident in legs and my upper body movement, when my back is on the ropes, so you don’t look vulnerable. Don’t panic when you’re in such a position, because when you’re in that position the last thing you want to do is give momentum and encouragement to your opponent. Even in the most vulnerable places, he thought me how to remain strong and effective. That was just by simply calm my mind when I’m in that place. Showing me how to bring the best out of my arsenal. In a lot of cases for a boxer especially a counter puncher in a corner, the first thing they can do is panic and if you do they may expose themselves and then they can get dropped or chinned. Andy thrives in this area, from experience. Remember John Jackson? When he knocked him out, Andy had been down twice already and Andy stayed composed. It was right off the ropes that Andy knocked him out and it was one of the knockouts of the year. The key to boxing’s seductive tendency is its stirringly obvious mental hardships. One-on-one combat is relatable. The oldest trick in the book of coping mechanisms, us versus them. On an elementary basis, we identify with at least one boxer’s plight in any fight, often times switching from one to the other as we witness the confidence, the panic, the determination or the fortitude. This mental element is as important to the boxer as the viewer. In fact, it is everything. It has all got to do with between the ears. Every boxer out there is putting the hard work in. It’s not about training for 100 hours or 90 hours. If you trained 100 hours for a fight and I trained 90, that doesn’t mean you’ll be in better shape. It's all about who is the most composed. Who has the most ultimate confidence in their ability and who is able to stay calm and emotionally stable in the heat of battle. That is what beats everybody, in the end. You either feel like your trailing and you go and end up making a mistake trying to put it right. You just [need to] think, regroup stick to your game plan or you could end up doing silly things and costing yourself a fight. It’s the person who doesn’t do that, who makes good choices at appropriate times that is the victor. It's all about that split-second decision making. You got to train like that too. Working with Andy, we train like we are defensive and then we train like we are going all out street fighter because there are times you have to do that. To forget about any gameplan, A, B, C, D, goes out the window. You just have to stick your feet to the canvas and throw like an absolute hell-for-leather maniac. Be a street fighter and then get back to your boxing again, there are so many different elements to it. It's just about knowing what to do when. Donovan is his own fighter now, but that wouldn't be the case without one crucial group of allies; His bedrock and dependables. Fans are the ones keeping it alive for me. I don’t have a promoter or manager investing in the team and it’s the fans that help me do this. It is them... I just hope I can repay them all by bringing back a European title. Eric Donovan features on the Ring Kings card at WIT Arena next Saturday, Feb 17th. For tickets contact Eric or the Healthy Living Shop in Athy.